In a world of man-spreading, pole-hogging, door-holding and other public transit nuisances, one might expect that there are times when a pregnant woman can’t get a seat amidst a sea of suddenly oblivious passengers. This might have even happened to you. So it’s with a sigh of relief that we learn today that there are still a lot of good hearts out there ready to rise to the occasion. 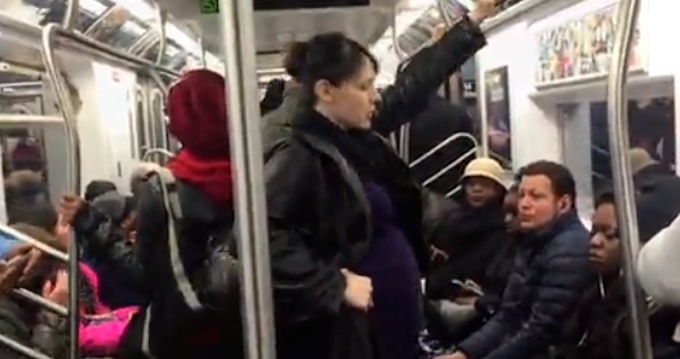 The team at Gothamist went undercover with a visibly pregnant woman riding the rails in New York City, along with a videographer filming at a distance with his phone, to see if people would respond by offering her a seat. Though surely there are folks out there who apparently don’t mind taking up a seat — heck, even two seats, when you account for leg spread — when someone else is struggling to stay upright in a crowded car with a stomach the size of a watermelon holding a human being inside, spoiler alert: Gothamist’s results will please you.